This looks like an image from a Science Fiction movie. But it is not. It is reality. 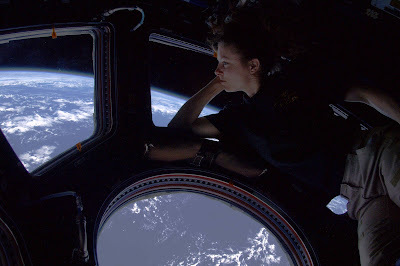 The image shows a real astronaut in a real space station and a real earth through real windows. We see astronaut Tracy Caldwell Dyson inside the cupola of the ISS space station. The cupola has been installed during Space Shuttle mission STS-130 on 15 February 2010. It is the largest window ever deployed in space. The Space Shuttle era comes to an end. It seems to the public, that not much progress has been made. But there actually is development. The cupola image is one indication. And more than 100 Space Shuttle missions result in unprecedented operational experience in space. Another sign for advance is the fact, that the Space Shuttle was not the only one. There are other "returnable" launch systems in active operation (X-37B) created by organisations with a budget, that is larger than NASA's.